I first learned to appreciate this anthem as a child watching the movie Chariots of Fire with my father. My father was an avid runner in the early 80’s and still continues to run to this day; he also is a devout Christian who seeks to earnestly honor the Sabbath Day. Clearly the movie Chariots of Fire would resonate deeply with him and become a Dixon family classic to be watched over and over. I never heard the anthem Jerusalem in a different context while growing up in Southern California and frankly, I never really understood the lyrics and didn’t bother to investigate. The lyrics are obvious rich in religious overtones, alluding to an apocryphal legend of Jesus visiting England as a youth that was immensely popular in England centuries ago. Although there are many fascinating angles, I would like to discuss just a few of the geographical imaginations embedding in this poem/anthem: the symbolic usage of Jerusalem and natural landscapes as metaphors of holiness and moral purity. This map that exaggerates vertical changes is one of my favorites of the area around Jerusalem. The topography of this area is deeply embedded into some religious metaphors. 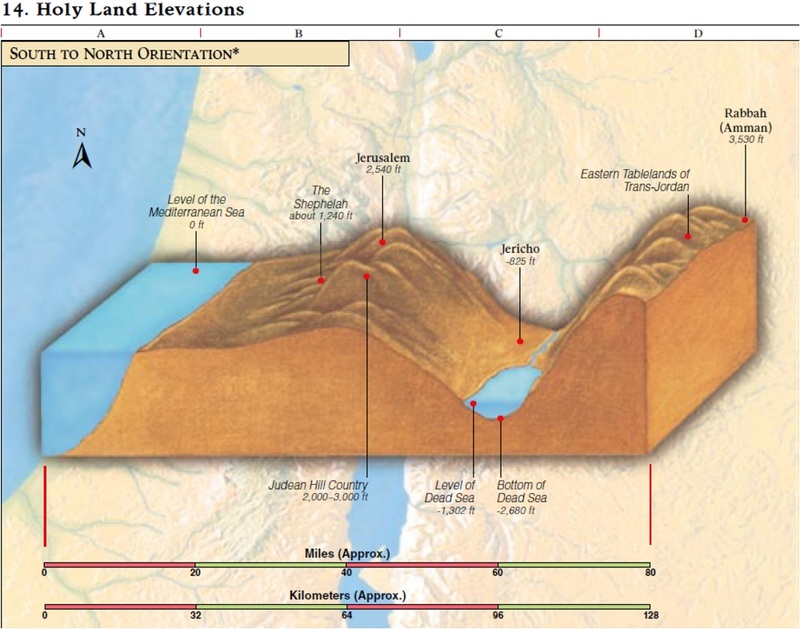 The Dead Sea rift valley (in parts 1000 feet below sea level) is a symbol for moral decay, and separation from God, where Jerusalem on the high ground (over 2500 feet), is a symbol for Heaven and communion with God. The New Testament story of the Good Samaritan (Luke 10:30) draws heavily on this topographic reality to convey spiritual significance. “And Jesus answering said, A certain man went down from Jerusalem to Jericho, and fell among thieves, which stripped him of his raiment, and wounded him, and departed, leaving him half dead.” The road from Jerusalem to Jericho given the massive elevation change and the local topography takes on added significance and I’ll offer two possible interpretations: 1) Leaving Heaven at birth, all people are thrown into a moral existence away from the presence of God and spiritually are battered and bruised and are helped along the way. 2) The man traveling the road represents anyone who has spiritually strayed and consequently is smitten by the unfortunate consequences of his actions but who can be resuscitated with help. I share this Biblical passage to highlight the literary symbolism that Jerusalem evokes for those that draw upon Judeo-Christian traditions: Jerusalem is analogous to Heaven. The questions about a possible visit by Christ to England are all rhetorical and there is no call to action until the possible presence of the Savior is juxtaposed with the “Satanic Mills.” There are many theories as to what these Satanic Mills may be, but given that it words were first penned in the early 1800s, it is safe to venture that that the author saw some of the negative effects of the Industrial Revolution and saw some analogies between the technological advances that transformed England with spiritual digression and moral decay as a poor urban underclass swelled in the factories and mills. Just like Jerusalem, pristine natural landscapes are another dominant metaphor in this anthem; pre-industrial landscapes are aligned with holiness and purity; an moral normative landscape. The Satanic Mills pollute the “pleasant pastures” and “clouded hills” of England, despoiling the innate goodness of the land and people. Just as Adam and Eve fell from the Garden of Eden (a lush natural landscape of verdant beauty), England’s pastures and hills are threatened by the mills and factories. So why did this song resonate so strongly in 1916? The British support for the Great War was waning, and the poem was put to music specifically to rally the English to sacrifice more, and to feel an even stronger connection to country. The memory of past greatness, in in the case of Jerusalem, to allusion to potential divinity, heightens the importance of place. Heritage tourism evokes past events of a place as a rationale for preserving, maintaining and defending a particular historical legacy and narrative, as does this rousing national anthem/hymn. The idea that Jesus could possibly have been in England during his mortal ministry fascinated nationalistic English Christians of the 18th and 19th centuries and the appeal of this song is in part a reverberation of that fascination. Even if it was a slim possibility, the song speaks of a yearning for it to be true, since the England that they cherish would become all the more spiritually important; Christ’s presence would have sanctified England just as it made the city of Jerusalem holy. Heritage tourism hinges on having visitors connect the importance of past events with current places. This imaged divine past is but one reason why the anthem Jerusalem is so captivating.